Workplace Secret Santas can be quite fraught with anxiety, especially when you’re perhaps not terribly close with your work mates or have little in common with them. I thought luck was on my side this year, since all my work mates are not only awesome peeps, but most of them are my really great friends even outside of the workplace. Judith is a doll collector, but I’d just given her a gift voucher to an amazing doll store for her birthday three days before, and I didn’t want to do the same again, and what $10 wouldn’t get her much. At about midnight the night before, I decided to exploit the “make a gift” loophole. I figured I wouldn’t technically be spending any money, because I already had the materials so the $10 budget was no longer an issue. But what to make? 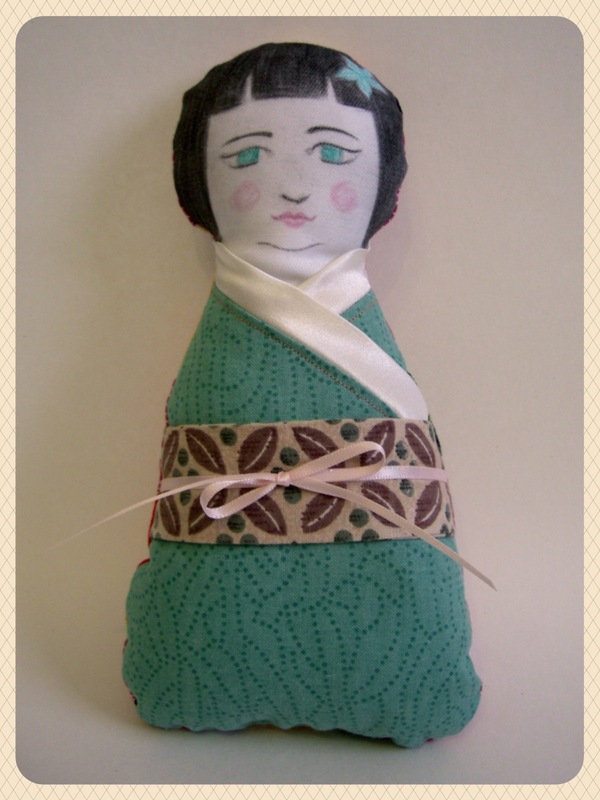 Then I remembered that we’d been oohing and ahhing over a book of Japanese cross stitch designs, and all of a sudden the idea formed: make Judith a Japanese doll; a kokeshi. Now, as with any “first editions”, there are definitely things that I’d change about her – if I make another she’ll be narrower at the bottom and less bell-shaped, and I’ll use a different fabric for her face because it was difficult to draw on and a bit smudgey – but regardless of these “lessons learned” I’m really very pleased with her, and Judith seemed to love her. Wikipedia Fun Fact: The design of "Mii" player avatars on the Nintendo Wii are inspired by kokeshi. As for me, I did very well in the gift stakes. I’m completely besotted with my dear friend Marelle and she drew my name! 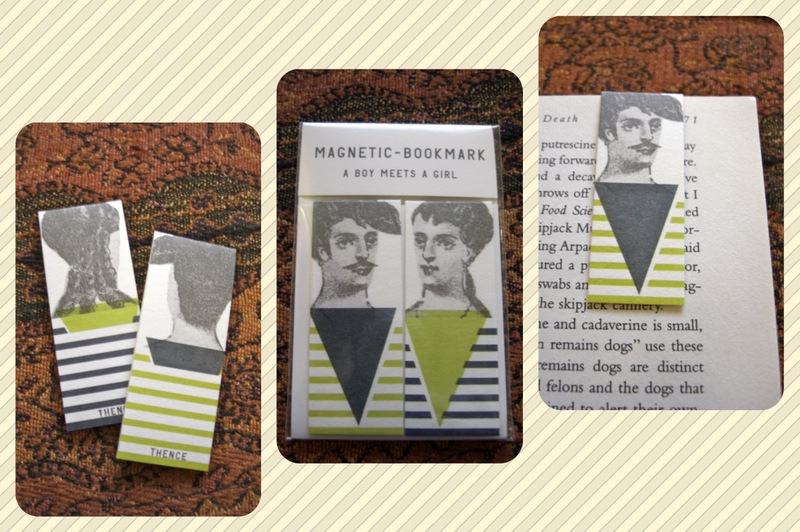 She gave me these neat little magnetic bookmarks and told me that the spiffy chap is me and the pretty lady is her. N’awww! And they were a perfect gift too, because of late I’ve gotten in the repugnant habit of dog-earring my pages to mark my place. I know, judge me as you see fit. But! No more! (In case you’re wondering, I’m reading “Stiff: The Curious Lives of Human Cadavers” by Mary Roach, and so far I’m loving it). Raynor & Marelle: In yo bookz, keepin yo place. What’s the best (or worst) Secret Santa gift you’ve ever gotten? Of Squishable Yarns… For Keeps! Oy, worst ever was a cheap-o knit hat from a dollar store. I know this because when my friend and I were Christmas shopping we stopped in the dollar store and she asked my opinion on a hat “for her sister.” I told her it was alright, and a week later I received it as a secret santa gift.. Our budget was $25! Womp womp. The worst part is I went all out for my person. Love the doll! The face is perfect! Oooh, that’s harsh! She’d have been getting a stink-eye from me for a few days. Geesh! such a pretty doll face!! i have just bought a secret santa for someone for friday…. will let you know how it goes. love your bookmarks too! Oh yes, do! Is it for a friend or co-worker? 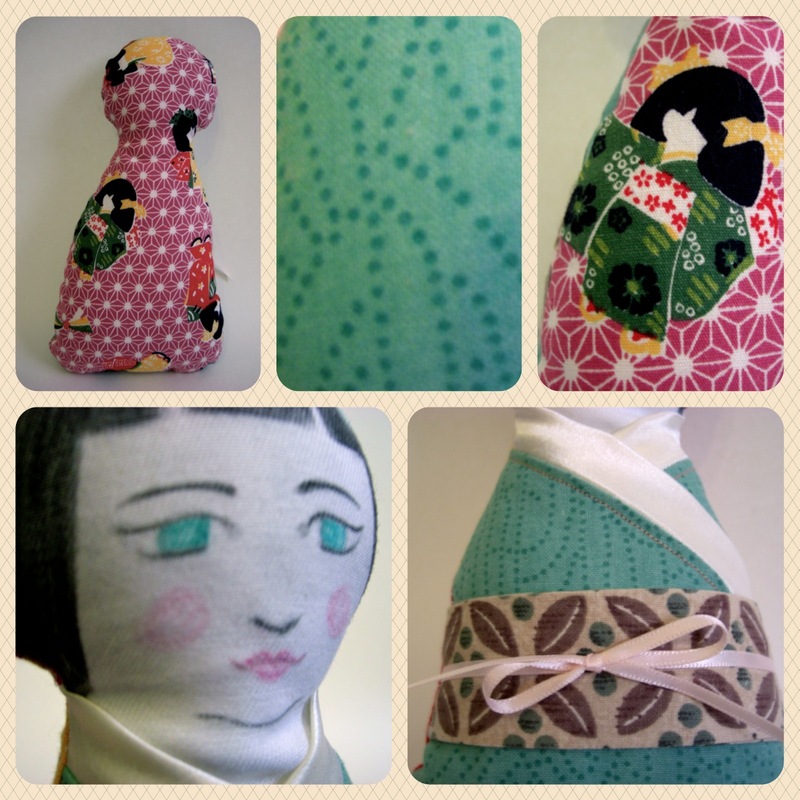 The doll is sweet and I love the fabric choice for her kimono. You drew her face so well and captured a soulful expression that I’m sure any smudging simply added to the effect. Oh I tried to read ‘Stiff’ but I found the authors’ commentary and one-liners really jarring – it probably wasn’t something I felt like at the time – so I didn’t finish the book. I Love your bookmarks though – what a great little touch of Victoriana (my favourite!). you are so freaking clever Raynor!! I’ll be seeing your face soon! Eeeeeeeeee! How did you make a girl cry with a Secret Santa? That’s epic!